When some people talk about vegetables, the leafy green vegetables always come to their mind first. 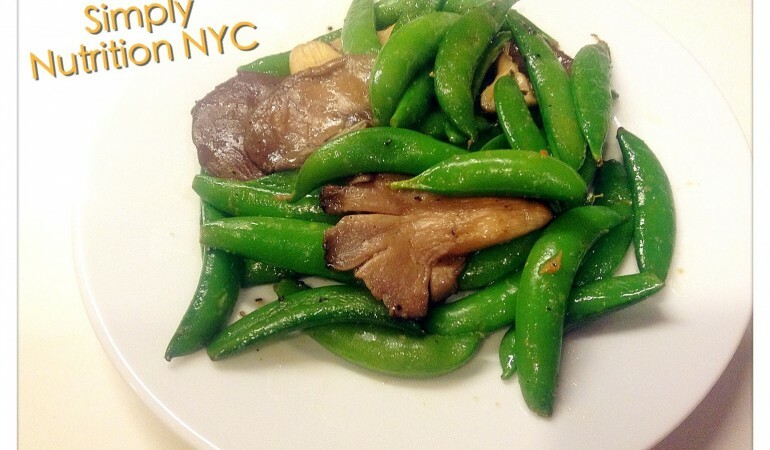 Sugar snap peas, snow peas, mushrooms, root vegetables are also vegetables. Sugar snap peas are green pods with peas inside. They are slightly more rounded in shape in comparison to snow peas. Their texture is more crisp and crunchy. Sugar snap peas are very good sources of vitamin A, C and K; good sources of fiber, iron, thiamin and folate. You might not be familiar with oyster mushrooms. Unlike tbutton mushrooms, the cap of oyster mushrooms is attached to their stem and oyster mushrooms are more flat. (See photo above.) Oyster mushrooms are good sources of fiber, protein, niacin, riboflavin, phosphorus, and potassium. *Niacin, also vitamin B3, helps functioning in digestive, skin and nervous system. It is important to convert carbohydrates to energy. Several studies have suggested that niacin helps increase HDL (good cholesterol) and decrease triglycerides and LDL (bad cholesterol), which can reduce risk of cardiovascular diseases (1) (2). 1. In a medium saute pan, add oil over medium heat. Saute garlic for a minute. 2. Add peas and cook for about 5 minutes till bright green. 3. Add mushrooms to peas and stir together for about 3 minutes. 4. Season with soysauce, black pepper and seasme oil. Stir for another minute. Ready to be served! (1) “The current state of niacin in cardiovascular disease prevention: a systematic review and meta-regression”, J Am Coll Cardiol. 2013 Jan 29;61(4):440-6. doi: 10.1016/j.jacc.2012.10.030. Epub 2012 Dec 19. (2) “The role of niacin in raising high-density lipoprotein cholesterol to reduce cardiovascular events in patients with atherosclerotic cardiovascular disease and optimally treated low-density lipoprotein cholesterol: baseline characteristics of study participants. The Atherothrombosis Intervention in Metabolic syndrome with low HDL/high triglycerides: impact on Global Health outcomes (AIM-HIGH) trial”, Am Heart J. 2011 Mar;161(3):538-43. doi: 10.1016/j.ahj.2010.12.007. Epub 2011 Feb 2.